How Much Money Should You Spend On Your Reception Desk? Saying that a reception desk is an important fixture in your company’s office is a gross understatement. As an invaluable focal point in the waiting room, it’s the first thing that a client will notice upon arrival, providing a face for your company to the public while likely serving as the first intimate link between the two. In order to create a reception space that adequately responds to your client base, it’s best not to treat the reception desk as a one-size-fits-all solution. Just like an office cubicle, the particular desk you’re looking for should be specifically suited to what your company does, from the kind of work that takes place at the reception area to the way your business interacts with the public. Given this wide variety of needs from company to company, costs will change with the variety of forms a reception desk can take. Therefore, it’s especially wise to take some below considerations into account, in order to help guide you toward money wisely spent on the perfect reception desk. There can be a lot of factors that influence the cost of any reception desk, but some are bigger cost-drivers than others. The materials used for the desk is one of these, with the more popular materials including solid wood, laminate, wood veneer (plywood), as well as metal and glass. The look of wood is still a very common aesthetic choice in a lot of reception desks, since it lends a comforting sense of warmth and sophistication. Cherry, mahogany, walnut, maple, and oak are classic staples. The darker woods such as cherry, mahogany, and walnut, establish a sense of tradition, giving clients a sense of your dependability, particularly when handling money or legal issues. Therefore they’re a good choice for more conservative fields like law, accounting, and other financial establishments. Lighter-colored wood reception desks give an airiness and lightness to a business, and so it could be a good choice for spas and salons, and especially medical facilities, where instilling a sense of positivism and optimism is important for visitors. Nothing beats the look of real, solid wood, but smaller companies or those on a tight budget might not be able to afford it for their reception desks. Luckily there’s wood veneer and especially laminate that can bring the look and feel of solid wood to your reception area, but which does so at a lower price point. Another benefit to veneer and laminate choices is their durability; they’re more scratch- and dent-resistant than real wood, and also have less tendency to warp. Materials like chrome and glass are good choices for more dynamic industries, where companies want to project a sense of ultra-modernity and sleekness. Companies such as those in the IT and design industries might find these more “modern” materials better suited to their reception desks. Keep in mind that higher-quality metal will be heavier and costlier than lower-quality metal. Size and shape are also major factors in the cost of a reception desk, with greater size naturally being more expensive. While ultimately the size of your space determines the size of your desk, finding the correct size of desk for your space can be a precarious decision. Your desk shouldn’t be so small that there isn’t sufficient space to accommodate all required tasks of the receptionist. However, the desk shouldn’t be so large that it leaves only a cramped space for visitors. You may even find that you need a reception center instead of a reception desk, which uses multiple receptionists to address visitor concerns. These are most often seen in large facilities and offices that handle a lot of traffic at any given time, such as hospitals and regional medical facilities. In terms of shape, a more complex shape—curved, U-shaped, L-shaped—will generally be more expensive compared to a simple rectangle. These shapes can offer more work-space to support a wider range of functions or to attend to more clients in a larger waiting room. Additionally, a more complex shape to your reception desk can make a grander statement than a rectangle would, while letting its unique look stand apart from the other furniture in your office space. One can’t talk about the cost of a reception desk without talking about its features as well. As already mentioned, a receptionist’s job can vary from office to office. In one company, the receptionist might just have a more basic role in greeting customers, making phone calls, and monitoring traffic. In another company, they can be tasked with much more, including document-handling. A very simple, basic reception desk can consist of just a flat writing surface across its length, and often one for private use by the receptionist on the other side for use of a computer or telephone or light paper-handling duties. These desks can start around $500 or $600 at the most basic, and they’d be a good fit for a hair salon, restaurant, or another hospitality setting. More complex reception desks are designed for more complex work, such as answering and redirecting calls, attending to emails and spreadsheets, preparing documents, making up schedules, receiving and distributing packages, and maintaining records of all kinds. Filing cabinets, storage drawers, keyboard trays, divided bins for binders and documents, open shelving, even task lighting… these are all options that can be added to the reception desk to support a wider scope of responsibilities. While these features are helpful, they also increase the overall cost of your desk. If your receptionist handles large amounts of paper documents and even packages, storage cabinets are an additional feature that can supplement binder bins and paper trays. They can be included as a separate piece of furniture situated along the wall behind the reception desk. This would also free up more space under the reception desk, important for anyone who has to spend their workday continuously at their workstation. These extra features to would fit right in at more document-driven businesses within industries such as medical, law, real estate, title companies, accounting and finance, and even mail-handling facilities. Reception desks can vary greatly in price based on what it is you’re looking for, costing anywhere from $600 for a basic desk to a higher-end cost of even $20,000 or so. An L-shaped laminate desk can cost from $1,000 to $2,100, while an L-shaped veneer desk in cherry can cost $1,500 to $3,200. A three-quarter round solid wood desk can run from $8,000 to $18,000! In all cases, adding glass to your reception desk, such as inserts or as a writing surface to your desktop, can greatly increase the cost of your desk by thousands. Keeping the features of your reception desk down to only what’s essential for your receptionist is a good way to reduce the cost of your desk. Since the material figures heavily into cost, you can choose a material that has high durability and lower cost, such as laminate or veneer. Don’t forget to consider the ergonomic features of your reception desk, such as the height relationship of work surfaces to chairs, as well as the accessibility of extra features included in the workstation. With the amount of time your receptionist will need to remain at their desk, this will help to reduce bodily injury, stress, and fatigue in the long run. 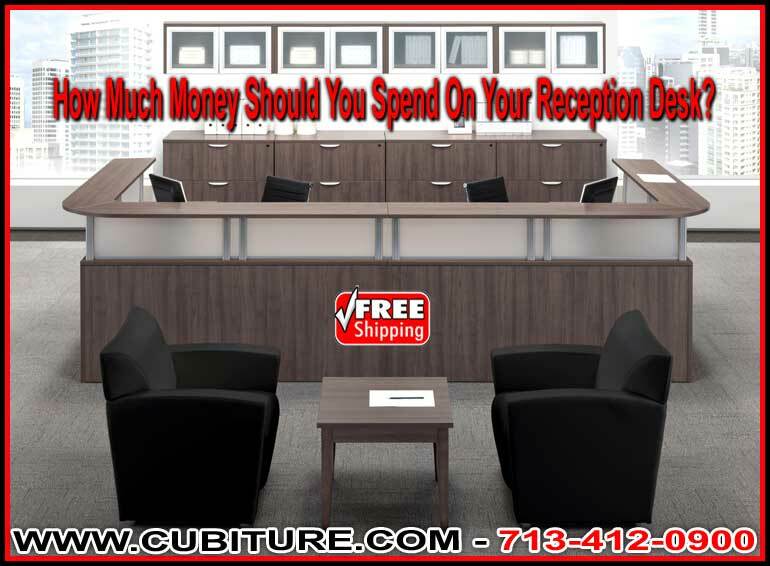 Give us a call at Cubiture so we can discuss what you need in a reception desk for your place of business. Jerry understands the importance of the face that your company shows to the world in how it receives its clients. Whether it’s a quality refurbished piece or a custom-designed and -built fixture, we can make sure that you get the perfect reception desk for your business. We work with an extensive number of factories that also ensures that no matter what kind of reception desk you need, it will always suit your budget.